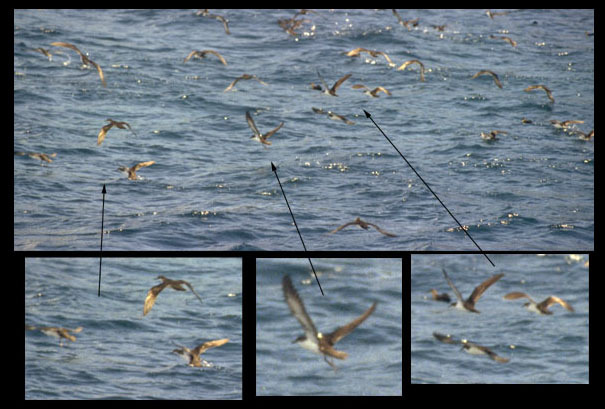 Audubon's shearwater (Puffinus iherminieri) is a medium sized sea bird commonly seen from the yachts. Typically, they skim close to the water, with intermittent periods of flapping and gliding. They always seem to be on the move, either individually or in flocks, and it is not often easy to get a good sighting, let alone a good photograph. The group in the photo below had been resting on the water, and were distrubed as our yacht advanced towards them. As can be seen in the photo, they have white bellies with dark brown wings and back, and a dark brown head with a white throat. They are most easily confused with the larger, less common Hawaiian or dark-rumped petrel (Pterodroma phaeopygia). Apart from size, the forehead and face of the Hawaiian petrel is white. Audubon's shearwater has a worldwide distribution, with populations in addition to the Galapagos in the western and central Pacific, the Philippine Sea, the Indian Ocean, and the Caribbean (it was once, but no longer, present in Bermuda). 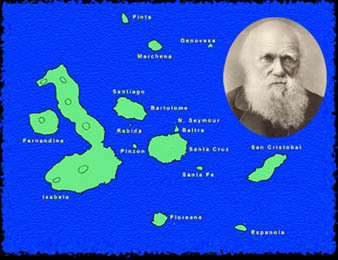 The Galapagos population is considered to be an endemic subspecies. Shearwaters are encountered throughout the archipelago, most frequently near the cliffs where they nest. They feed on small planktonic crustaceans and fish larvae, which they take from the surface, and on small fish, and squid, which they catch by plunge diving to depths of about six feet. It is not uncommon to see them in fishing in large flocks, or in mixed flocks with pelicans and brown noddies. Audubon's shearwaters lay a single egg in holes in the sea cliffs. The average hatching time is 51 days, during which both parents incubate the egg. Both parents also feed the chick until fledging, about two and a half months later. They breed throughout the year and a successful pair can produce a chick about every 9-10 months.